Mrs. Mol was born in Grand Rapids, Michigan and has lived in this area for most of her life. Her parents moved to Loveland, Colorado for about two years when she was a toddler. 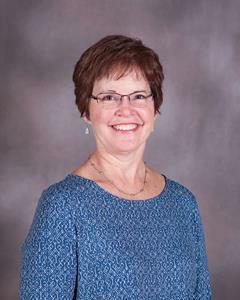 She has been a member of First PRC (GR), Loveland PRC , Hope PRC and currently is a charter member of Faith PRC. She attended Adams Christian School (grades K-2), Hope Protestant Reformed Christian School (grades 3-9) and is a graduate of Covenant Christian High School. She also attended Grand Rapids Community College and Davenport College. She is the mother of five children, Ben (Rebekah) Mol of Hudsonville, Jamie (Mike) Noorman of Jenison, Kelly (Benjamin) Noordermeer of Jenison, Kristian (Andy) Talsma of Jenison, and Whitney Mol of Byron Center and grandmother to eleven grandchildren. Administrative Assistant at Covenant Christian High in the summer of 2013. She finds the variety of tasks to be very challenging and enjoys the opportunity to work with the Board, faculty, staff, and students alike. When time allows, she enjoys boating in the summer, reading, camping, and spending time with her growing number of grandchildren.